Book Today For A Low Deposit Of £49pp | Add Jack of Lights Vegas Strip Helicopter Tour with Limousine Transfers and champagne check in for £80pp! Glamorous triple-towered hotel and casino on the legendary Las Vegas Strip. Boasts three nightclubs, two swimming pools, two bars, and seven unique restaurants. 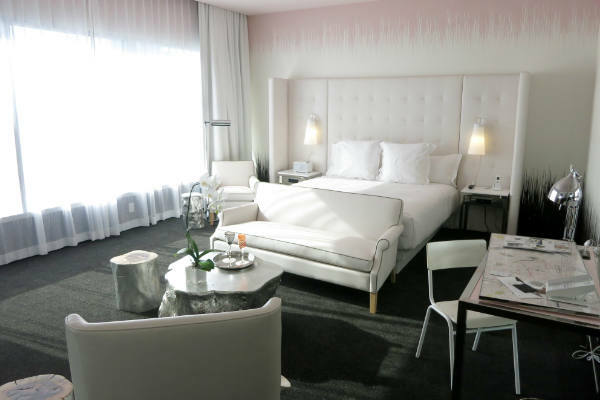 Sleek, modern guest rooms decorated in a suave and sophisticated style. 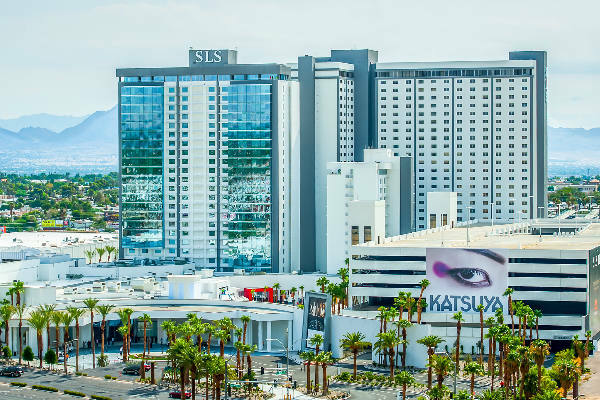 Located at the north of the iconic Strip, SLS Las Vegas is a sleek and sophisticated retreat, adorned with impeccable style and luxury. 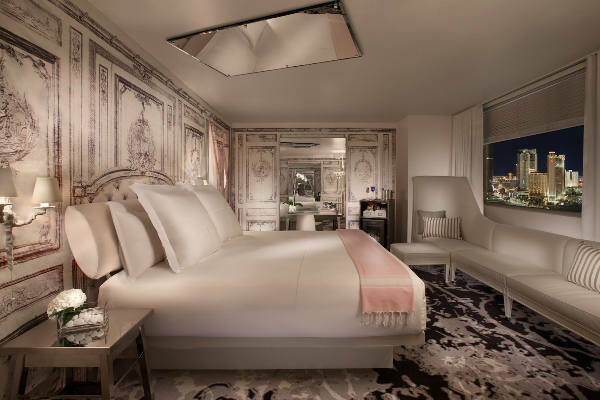 Home to over 1,600 guest rooms in three landmark towers, guests are treated to uncompromising views of fabulous Las Vegas within beautifully decorated spaces. Guests can also indulge in nourishing treatments at the spa, soak up the sun at the expansive rooftop swimming pool, or spend up a storm at the on-site retail outlets. A multitude of exquisite dining venues serve an alluring array of flavours from across the world, including Mediterranean, Asian and rustic all-American favourites, while the lively bars are the perfect spot to enjoy a signature drink. 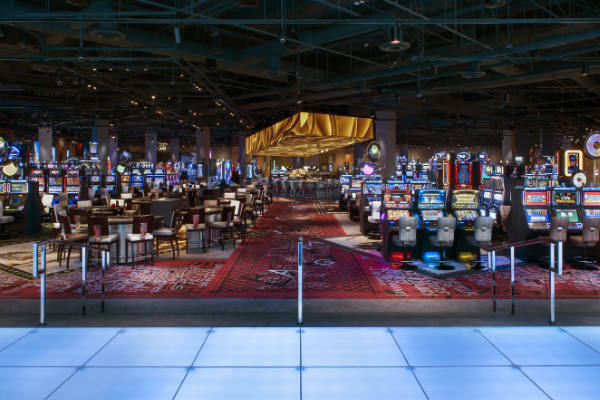 This hotel remains very much in touch with its location's historic significance, paying homage to the classic Las Vegas atmosphere with acclaimed musical performances and a 60,000 square-foot casino for an unforgettable stay in Las Vegas. 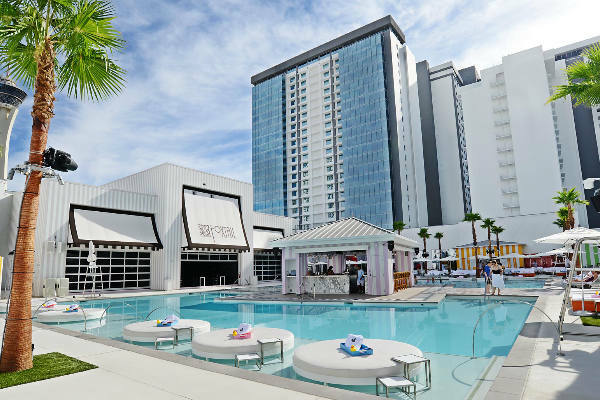 This Las Vegas hotel is home to fantastic on-site facilities including: two expansive swimming pools, full-service salon, fitness centre, SLS retail outlets, casino, spa, nightclub, live music venue, eight dining venues, and two bars. There's also: complimentary shuttle service, concierge, valet service, laundry and dry cleaning service, and Wi-Fi. 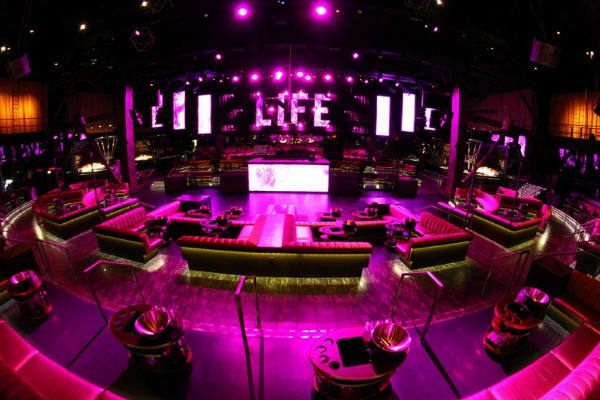 SLS Las Vegas is home to eight fine and casual dining venues. 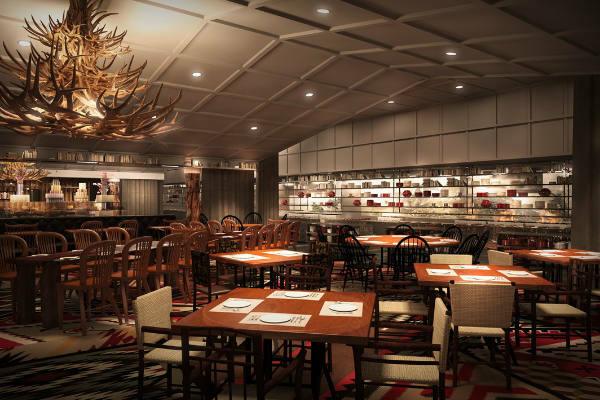 Bazaar Meat by José Andrés has been dubbed one of "Las Vegas' Best Steakhouses", Katsuya serves Japanese fusion dishes and Cleo features Mediterranean favourites in an elegant setting adorned with Moroccan tiles and marble counters. For vibrant Asian dishes there's Ku Noodle, exceptional and award-winning burgers are served at Umami Burger, and the authentic taste of Italy can be found at 800 Degrees Neapolitan Pizzeria. For laid-back dining, Northside Cafe serves up home-style cooking and the Perq Cafe treats guests to freshly-brewed coffee and sweet pastries. This grand hotel also hosts a premier nightclub, Center Bar which serves handcrafted cocktails and Monkey Bar, situated in a intimate open-air courtyard. 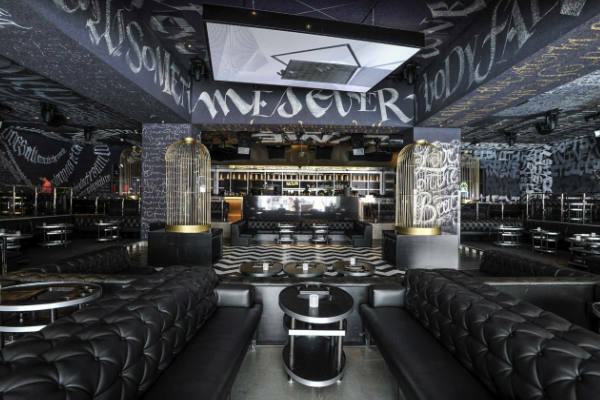 Lively events take place at both pool areas and at the one of the best-loved music venues, The Sayers Club. The hotel's state-of-the-art fitness centre offers a range of cardio and weight training equipment, Ciel Spa offers a menu of luxurious spa treatments and the salon features a range of hair and beauty services. 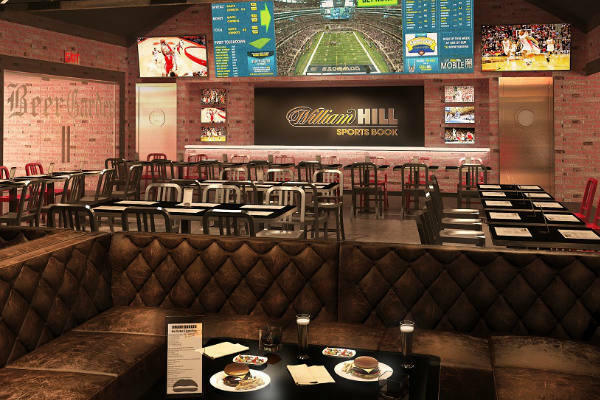 On-site there is also a retail outlet and a 60,000 square-foot casino with slot machines, game tables and a race and sports book. The 1,613 guest rooms are set in three hotel towers - Story, Lux, and World - each with its distinct personality and unique, opulent style. 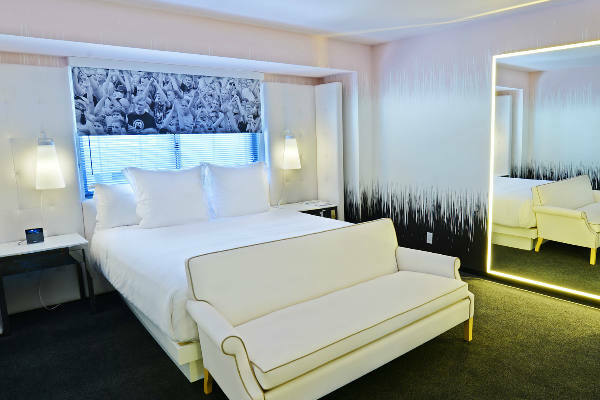 As standard, each room includes: exclusive Sleep Lying Still Beautyrest Mattress by Simmons Hospitality, 300 thread count linen, Signature Saints & Sinner snack box and minibar, HD TV with digital programming, Ciel spa amenities, and luxury showers. Las Vegas' desert climate means temperatures vary from cool on winter nights to absolutely scorching on summer days. Generally, daytime highs rarely dip below the teens, making Las Vegas a popular holiday destination at every time of year. Visit in spring and autumn for warm, pleasant days. 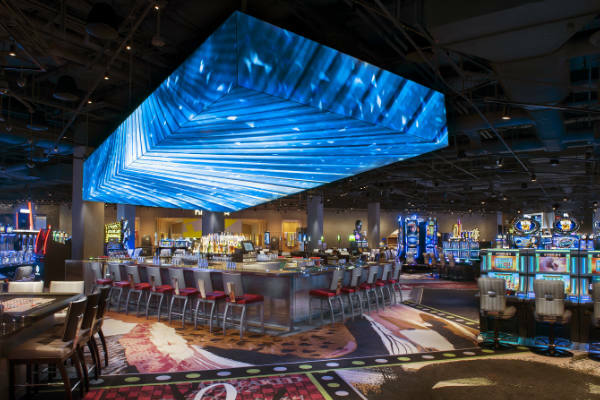 The casinos and clubs in Las Vegas are open 24/7, so you could be forgiven for wanting some serious downtime during the day. Chill out by a cool pool and recharge your batteries ready for another night of fun. If you do want to keep going in the day, there are a plethora of museums, white knuckle rides and attractions at your disposal. The shopping's phenomenal, with some of the biggest malls on the planet and excellent discount outlets. Out of the city, the Nevada Desert and the mesmerising Grand Canyon are real must-see sights. You can eat food from just about anywhere in the world in Las Vegas. Along the Strip and in the hotels, you'll find cuisine from Japan, China, Italy, the Caribbean and beyond. Dining in Las Vegas brings a whole new meaning to the term ‘all you can eat' with eye-popping buffets open all over the city. Head downtown for even bigger portions and cheaper prices. If you're looking for a fast fix of burger, pizza or fries, you've come to the right place. Las Vegas rocks at night time – and there are literally hundreds of things to do. Of course there are the casinos (the highest concentration of them on the planet, as it happens) but you'll also find concerts from big name artists, circus shows, awesome theatre productions, stylish cocktail lounges, late bars and nightclubs. Take a trip along the Strip in the evening to capture the electric atmosphere and twinkling lights. Guide price is per person. Based on 2 people sharing for 5 nights on Room Only. Flying from regional airports. Year round departures. All overseas transfers available.